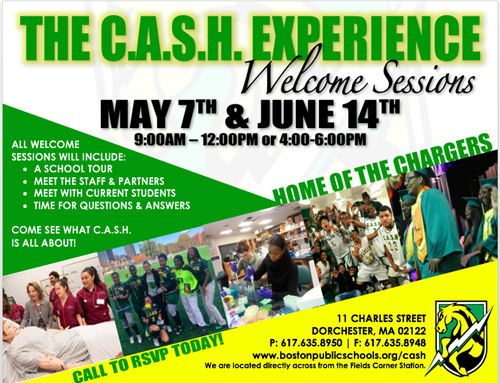 The Community Academy of Science and Health (C.A.S.H.) is one of Boston Public School's small, Science and Health Careers themed high schools. Our curriculum is centered on our academically challenging Science and Math courses, and our literacy programs. Located in the Fields Corner area of Dorchester, C.A.S.H. has an unwavering commitment to providing underserved populations the access needed to further develop their awareness of and response to their civic obligations and to enrich their academic and leadership skills. Additionally, C.A.S.H. is committed to service learning, which has become a major characteristic in the identity of C.A.S.H. With a committed staff, key community partners and a culture that cultivates success, C.A.S.H. is moving forward to build leaders and propel students toward academic and personal success. The CASH Parent Council is currently meeting the first Tuesday of each month at 6pm. Join us for dynamic conversations, relationship building and a hot meal! We want you here! For more information call us at 617-635-8950. CASH Pride Meetings meet Wednesdays after school in Room 308b; Students with questions may see Heather. Sole Train has started! To sign up or for more information, see Ms. Talbot! 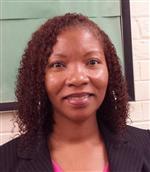 Ms. Gakpo is in the building on Mondays, Wednesdays, and Fridays in the Guidance area, Room 220. Seniors, please prepare all your materials, dues and information now because senior sign out will begin May 29th. Please remember that you must have immunizations, a resume on file, senior dues and AP fees paid off in order to sign out. Welcome! I am Robin Lee, the Headmaster. As you browse through the site, you will learn more about our school community: academic programs, staff, student activities and more. We have an open door policy and invite you to come see the amazing things we are doing. We are CASH where Challenges are Accepted; Success Happens!